I HAD the nerve to leave my board review materials behind for the promise of a relaxing out-of-town trip. I went to the quaint town of Dinalupihan, Bataan, on June 12. With me were Manong Ralph and Kuya John Dasmarinas, whom I haven't seen for more than a year since he had relocated to Singapore for work. 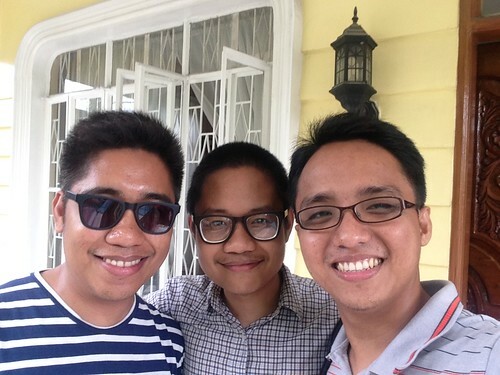 The last time I'd been to Bataan was in 2011, during the Holy Week, when Paul Velasco (who had just flown in from New Zealand) and I ransacked Jason Enriquez's home in Balanga. The purpose of the trip was to visit Kuya Bryan de Guzman, my brother's close friend from way back in his freshman year at UP. 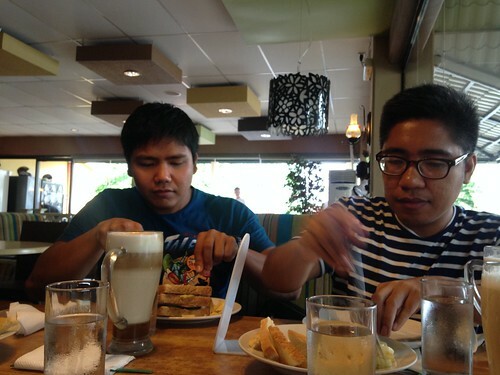 The friendship started with Kuya Bry's unlimited supply of food, which my brother preyed on. 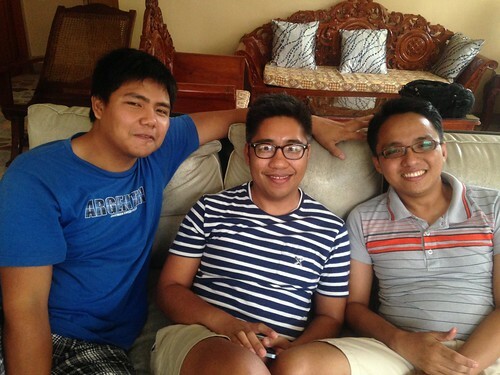 Kuya Bry, my brother, and Kuya John have remained close since then. We took the 6 AM bus trip—not a problem for us, as we were all morning persons. 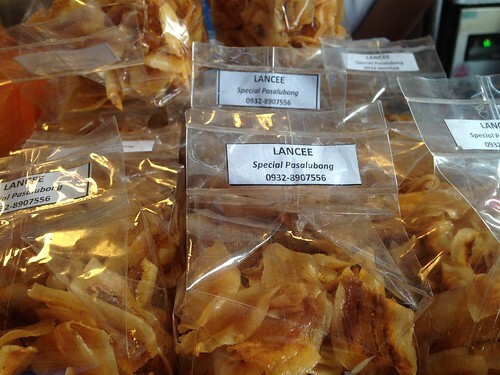 At the station we spotted these, banana chips whose packaging bore a semblance to my name. We left at 6:30 AM. Traffic was light. The roads were clear. The skies were gloomy. Perfect. 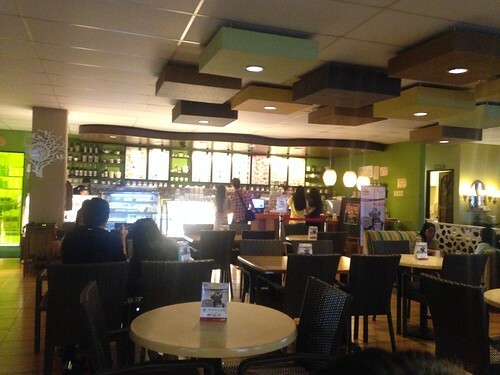 Before we knew it, we were already at the Dinalupihan town center, where Kuya Bry was waiting for us. We spent the morning—and pretty much the rest of the day—in his beautiful home. At some point we all fell alseep on the couch. The rain was pouring outside, and it was so cold we didn't need electric fans at all. Lunch was served—sinigang, shrimps, and an assortment of juices. We ate like hungry lions. When the rain subsided, I looked out of the terraced and saw a tree. "Atis ba 'yan?" 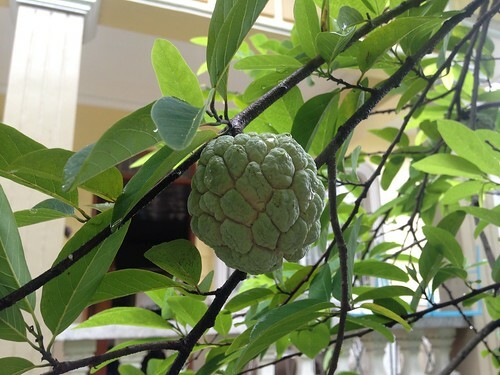 It was my first time to see an atis tree. I had to take a photo. 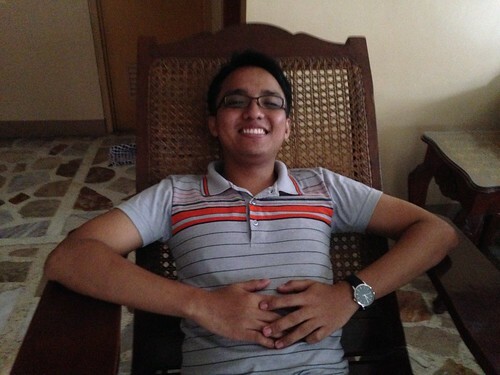 Here's Kuya John on the rocking chair. 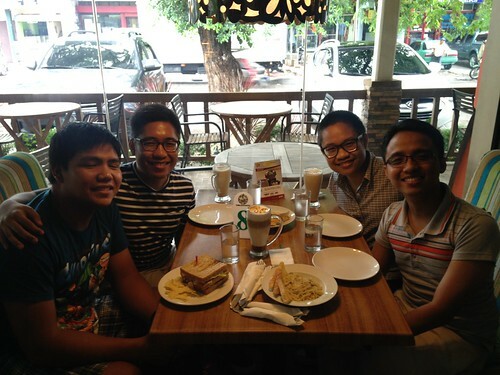 Kuya Bry, Manong, and Kuya John, were catching up with each other. They talked mostly about their other friends. Meanwhile the BBC University Challenge was streaming on YouTube. After our refreshing afternoon nap, Kuya Bry drove and treated us to a coffee shop in Balanga City, capital of Bataan, some 45 minutes away from Dinalupihan. I don't remember the name of the restaurant—Green Bean, or something like that—but I liked the ambiance and the quiet. The first thing that came to mind: I could study here. The food was excellent. 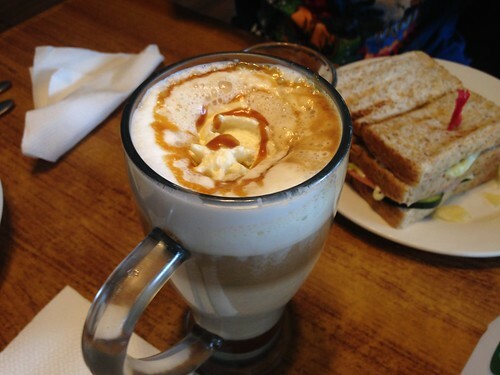 The caramel macchiato was filling. The pasta tasted right. The cheesecake had the solid consistency I prefer. 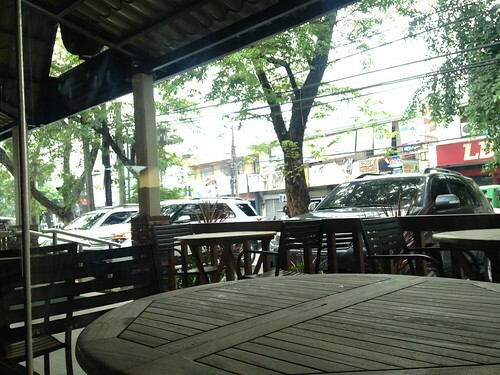 The view outside the coffee shop had a rustic, European feel to it. I'm grateful for many of my brother's friends. 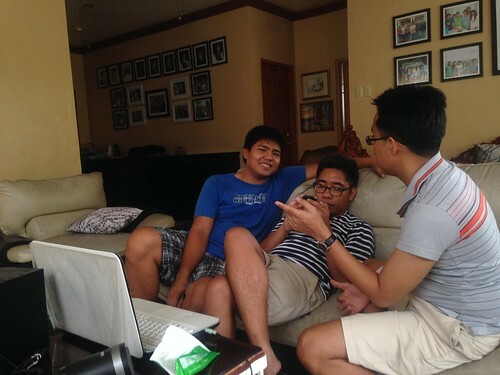 I like to joke around (and there's some truth to this) that Manong's friends are generally nicer than him. Some of them, like Kuya John and Bryan, have become kuya figures to me. Seeing how they've turned out to be—in their careers, in their families, and in their walk in the Lord—has brought me so much encouragement. How they speak of God's faithfulness in their lives, and how they've lived for Him! I was reminded of Psalm 1:3, "He is like a tree planted by streams of water that yields its fruit in its season, and its leaf does not wither. In all that he does, he prospers." Such is true of people who put their trust in the Lord. Kuya Bry insisted that we spend the night at his house. Unfortunately we had unfinished business in Metro Manila. We promised we'd be back, though. Thanks so much, Kuya Bry. Sa uulitin. Mmm, atis. And BAKED cheesecake with CHERRIES? Double mmmm. Hindi namin nakain ang atis—hindi pa raw hinog. (May atis ba sa mall?) 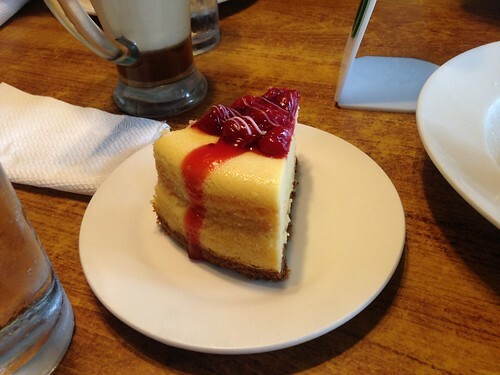 Pero masarap ang cheesecake.